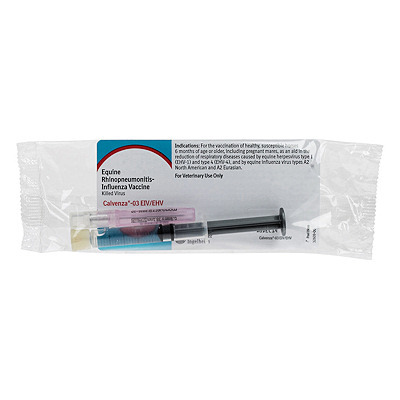 Calvenza 03 EIV/EHV (Boehringer-Ingelheim) Single Dose loaded in a syringe with needle.Nasal canuala also included. A killed virus vaccine that provides protection against rhinopneumonitis respiratory disease caused by EHV-4 and EHV-1. Also provides immunity against equine flu types A1, A2 And cross-protects against all other equine influenza strains. Features:Unique EHV-1 equine respiratory origin isolate. Stimulates antibody to EHV-1 And EVH-4. Proven efficacious against EHV-1 And EHV-4 in challenge studies. Incorporates North American (Kentucky/95) And Eurasian (Newmarket/2/93) EIV A1 And A2 strains. Efficacy based on challenge studies for EIV. Novel adjuvant. Safe, all killed vaccine. Includes innovative pliable nasal applicator. Benefits: Flexible dose administration. Three dose regimen conforms to AAEP recommendations. No reversion to virulence concern. Minimal vaccine site reactions. Advantages:Calvenza EIV/EHV is proven safe. Calvenza EIV/EHV is proven effective by challenge. Dosage And Administration: Using aseptic technique inoculate horses IM with a 2 mL dose. Administer a second 2 mL dose IM in 3-4 weeks using a different injection site. Administer a third 2 mL dose in 3-4 weeks either IM or IN. Revaccinate annually. For the vaccination of healthy, susceptible horses 6 months of age or older, including pregnant mares, as an aid in the reduction of respiratory disease due to equine herpesvirus type 1 (EHV-1) and type 4 (EHV-4) and by equine influenza types A1 and A2.